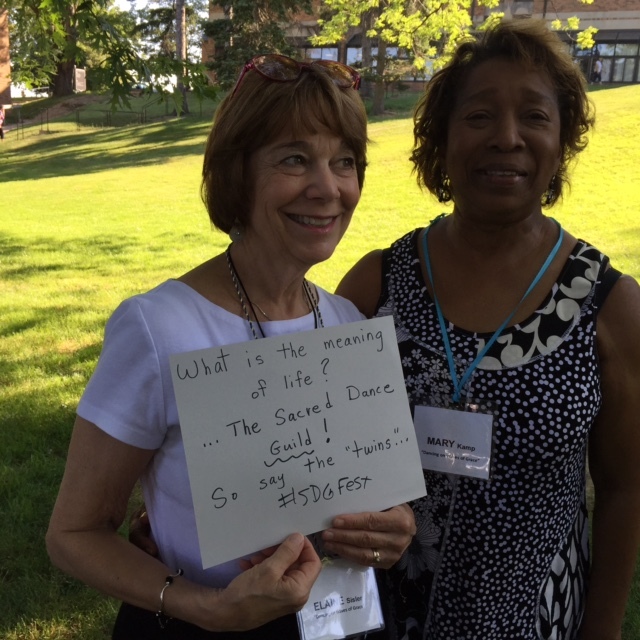 Sacred Dance Guild Journal Since 1958 articles by members & guests offer news about activities, history, Sacred Dance practices, profiles of Sacred Dancers, choreography, images & illustrations. From the moment the first attendees arrived, one could feel joy and excitement in the air. Festival is always an opportunity to meet, greet, and connect with interesting dancers from near and far. This year was no exception. There was a palpable intensity whereby we immediately felt bathed in grace as we gathered together to dance, learn, observe and celebrate our diversity. Our opening celebration began with dancers in a large circle outside of Warde Hall, our comfortable home away from home for the next six days. We divided ourselves into four groups and danced our way through the beautiful Mercyhurst campus singing, chanting and waving scarves. We gathered in the dining hall where co-program directors, Mary Kamp and Elaine Sisler welcomed everyone to Festival 2015. Peggy Hoffman and SharonWerth, our faculty chairs, introduced each of our major presenters and workshop leaders. The presenters gave a brief description of their work each dancing a signature move to pique our interest. Emmalyn Moreno, one of our festival musicians, invited everyone to learn “Waves of Grace” our official festival dance. Soon the room was vibrating with enthusiasm, giggles, moans and moving bodies. We took a short break to greet and welcome new friends. There was an abundance of smiles, hugs and even a few tears as we connected with old friends and new. 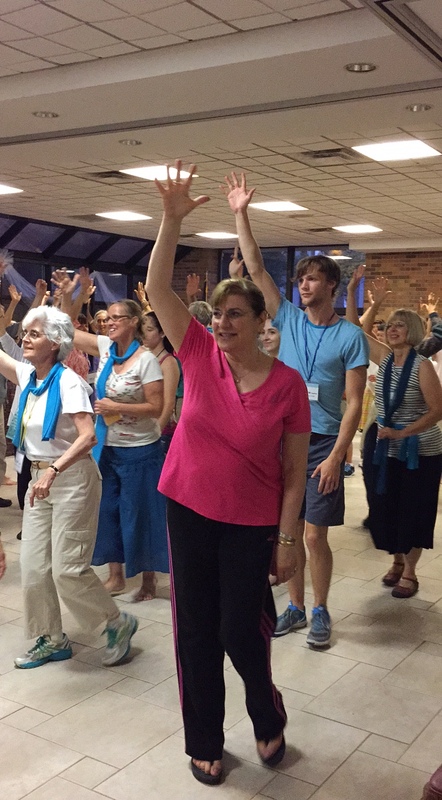 Next, Elaine Sisler taught the Flash Mob dance “Wade in the Water”. Weary from travel and a spirited dancing opening we all adjourned to our beds dreaming on waves of grace. 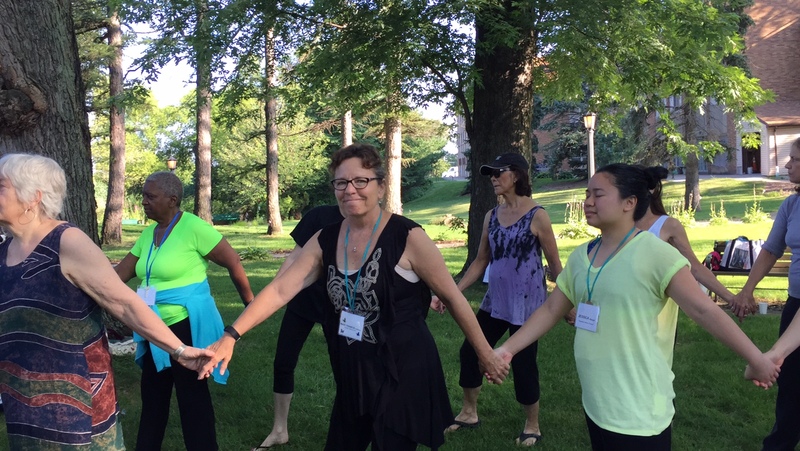 Each morning early risers enjoyed “Moving Meditations” with Helena Froelich, “Authentic Movement” with Mary Frances Hoffman and “Sacred Circle Dances” with Ellen Roberts Young. After breakfast each morning (which was always delicious) we gathered in the beautiful grotto for “Morning Gathering” with Rick Kessler and Emmalyn Moreno for meditation, Moving Mysteries and Dancing On Waves of Grace. 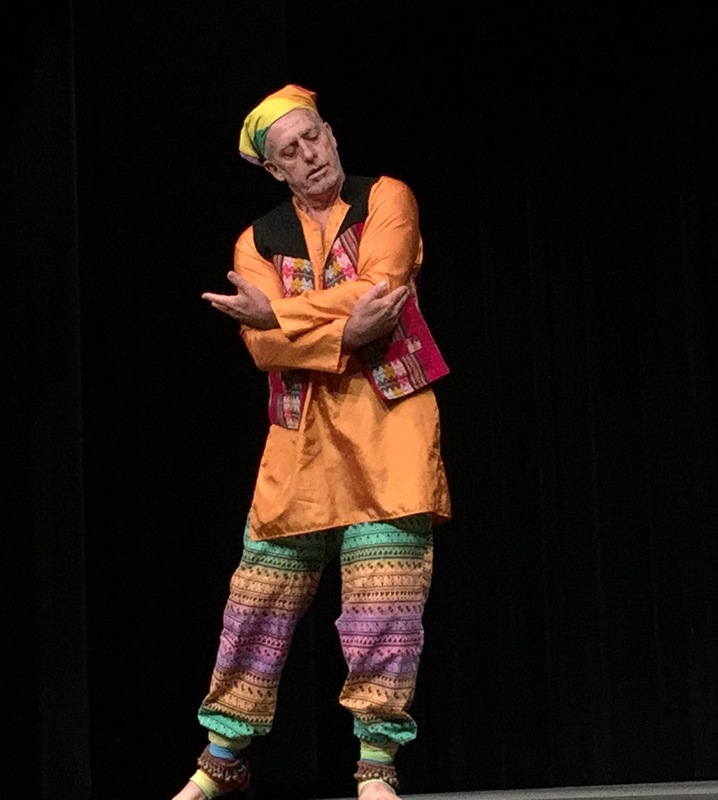 Each afternoon we had the opportunity to present our dances in informal sharings in the Taylor Theatre. Saturday was our sampler day. 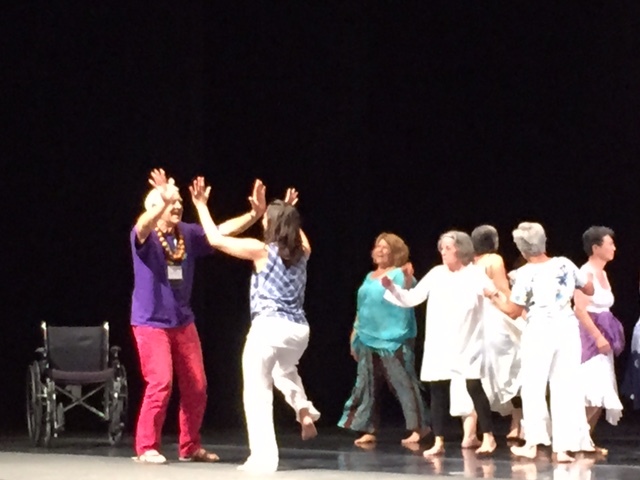 It was thrilling to see dancers of all ages and abilities dancing in each class. The studios were comfortable and spacious allowing us to safely dance with abandon. Saturday evening was the festival concert in the beautiful Performing Arts Centre theatre. Jessica Clark was our lovely emcee introducing the dances to a lively audience. Sunday we enjoyed our in-depth courses in the morning and then it was off to the Chautauqua Institute for many of us. Those who stayed on campus participated in Pop-Up sessions facilitated by board member Jessica Clark. On the way to Chautauqua we visited the Courtyard Winery for a wine tasting. To thank the owner for being a gracious host we sang and danced “Moving Mysteries in the tasting room before reboarding the bus. This was the first time anyone had danced at the winery! Once arriving in Chautauqua some of us shopped and walked around the quaint village. Others attended a choral concert and we all danced our flash mob on the town green. Earlier that morning Trinity Church Wall Street dancers performed their “Reconciliation” dance under the direction of Marilyn Green. That evening we had a beautiful dinner at the Athenaeum Hotel overlooking Lake Chautauqua. We repeated our flash mob dance after dinner on the grassy area next to the lake. Then we all went to the historic amphitheatre for a sacred song service titled “Dancing with God”. 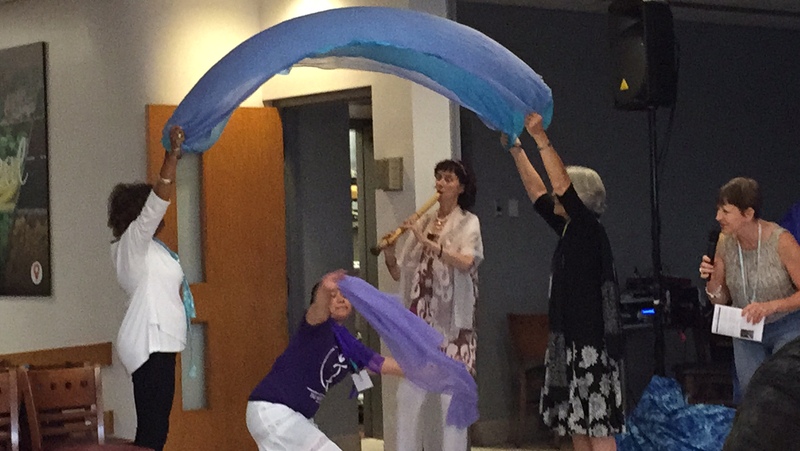 This was the first time that dancers were invited to dance at the sacred song service. SDG board member, Noelle Partusch, along with Mercyhurst students Sophia Schroeder Andreyev, Matthew Huefner, Olivia Lane and Alexis Nale performed with elegance, intension and grace during the service. Since 1907, Largo by George Frederick Handel has been played on the organ to close the Sunday evening service. Part of the custom has been to remain seated until the piece is finished. This time by invitation, the stage was flooded with members of the Sacred Dance Guild dancing our hearts out to the powerful organ music. As the piece ended there was thunderous applause and many audience members were in tears. This was the first time anyone had danced during the Largo. It was also the first time that many members of the audience had seen sacred dance. It was clear that something very unique and special occurred that evening. Monday was busy with classes and workshops. We relaxed in the evening with an outdoor banquet “A Taste of Erie”. It was a spectacular summer night with local vendors, fine regional food, wine, an auction and a performance by hoop dancer and director of Lake Effect Hoop Troop, Jennifer Dennehy. Tuesday was our last day of classes and workshops including a watercolor painting class instructed by festival market place co-coordinator Diane Dean. We also conducted our SDG Annual General Meeting where former SDG presidents took turns reading the “State of the Guild Address” as prepared by current SDG president Wendy Morrell. Wendy’s presence was greatly missed throughout the entire festival and we prayed for her and her husband, John (Previous festival photographer) every day. Tuesday evening festival musician, Debbie Danbrook, opened the Faculty Concert. She performed a stunning music meditation singing and playing her Shakuhachi flute. Debbie is the first woman to have mastered this difficult instrument. The dances performed by the faculty were inspiring, thought provoking and excitingly entertaining. The evening ended with a post concert reception with more good food and wine. And so ended “Dancing on Waves of Grace” Festival 2015. We hope that the Sacred Dance Guild will continue to grow in membership so that we will continue to dance in peace and harmony to promote dance as a sacred art at yet another wonderful festival! Special thanks to Wendy’s envoys Michelle Shortall and Diane Dean for their fabulous administrative skills, level headedness, hard work and humor. Mary and I would not have maintained our sanity or directed a successful festival without them! Mary (Ohio) has been co-Director of Programs since 2009. She was SDG Festival Co-chair in 2010, 2012 and 2015. She is the Director of Dance Ministry at Kennedy Heights Presbyterian Church and a faculty member at De La Arts Place, a non-profit center for the performing arts. Mary is a teacher, performer, choreographer, company director and workshop leader with over 40 years of experience in dance. She has led liturgical dance workshops in the U.S. and abroad. Elaine (Massachusetts) has been co-Director of Programs since 2013 and a member of the SDG’s board since 2009. Elaine spearheaded the SDG’s Sacred Dance Global Outreach program and organized CultureFest 2009 and 2012. She was Co-Chair of the 2015 festival. 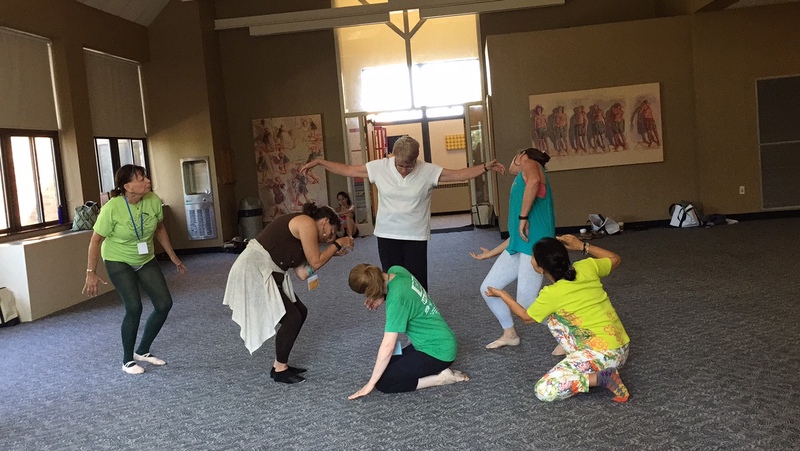 She is an experienced dancer, classroom teacher, arts educator and advocate who has developed, coordinated and implemented a variety of integrated arts programs in Maryland, Connecticut and Massachusetts. Elaine performs with Encore Dance Ensemble, and is a member of Skyloom Sacred Dance Group.